In the second part of this article, I will describe some diverse uses of live electronics. These various approaches can all represent noteworthy techniques, potentially to be used either separately or in combination, within a single real-time system. The works to be covered include Cluster by Enrico Francioni which makes use of the timeline (utilising the timeinsts opcode) and delay-lines, eSpace by Enrico Francioni which is an example of a quadraphonic spatial signal, Accompanist by John ffitch which is based on a reaction to rhythmic impulses, Claire by Matt Ingalls which is based on the pitch and the randomness of signal reaction, Etude 3 which is an experiment by B McKinney based around the pvspitch opcode, and Im Rauschen, Cantabile by Luis Antunes Pena which is based on keyboard commands using the sensekey opcode. A number of tutorials have been prepared that demonstrate many of the techniques that are described in this article. They can be downloaded as a zip archive here. My work Cluster, for any instrument, live electronics and fixed medium, comprises three constituent elements: the sound of the solo instrument, the reproduction of the sounds of the instrument (processed in a variety of ways), and the part for fixed medium (tape). Shown below is a page of the score, in this instance for vibraphone, live electronics and prepared electronic sound. Figure 1. Page 1 from the score for Cluster by Enrico Francioni. The version with live electronics interests me for several reasons. One reason is how the soloist can engage in a dialogue with the various complementary sounds through exploiting the ability of the algorithm to capture, reproduce, and delay some of their phrases. I think that within this scenario there are aspects in common with with Solo N.19 by Karlheinz Stockhausen about which I wrote in Part I of this article. Another reason that this piece’s method interests me is that the signal path within the code is always dominated by a time-line, thereby allowing specific events from the live score to be isolated and processed in specific ways. For this I used the k values of timeinsts. This data allowed me to implement events, as described above, simply by following conditional branches in the code. In the first instrument we hear the original signal output processed in two channels. With the second instrument we will hear the original signal processed ans with a delay in two channels. This piece is also interesting in terms of the spatialisation of the sound materials within a quadraphonic system. I am particularly interested in designing sound paths through the acoustic space that have a logical sense. The creation of the fixed medium/tape part for this piece was not trivial but hearing it, it is clear that it contains material obtained, at least tonally, from what has already been heard. The sound of the live instrument in this piece is, at various times, treated or left untreated by the software, sometimes it is relayed back in real-time and at other times delayed but it is always subjected to spatialisation. The prepared part for fixed medium is made up of bands of sounds that form clusters and that serve as the backdrop to the other sonic components. These sounds come from a single pitch from a vibraphone (B3) and are treated, in deferred time, with spectral analysis and resynthesis. A specific example of this kind of processing in Csound is the phase vocoder. This piece is carried out as a ‘one-man performance’. This is fulfilled with the assistance of the graphical interface which is of fundamental importance. 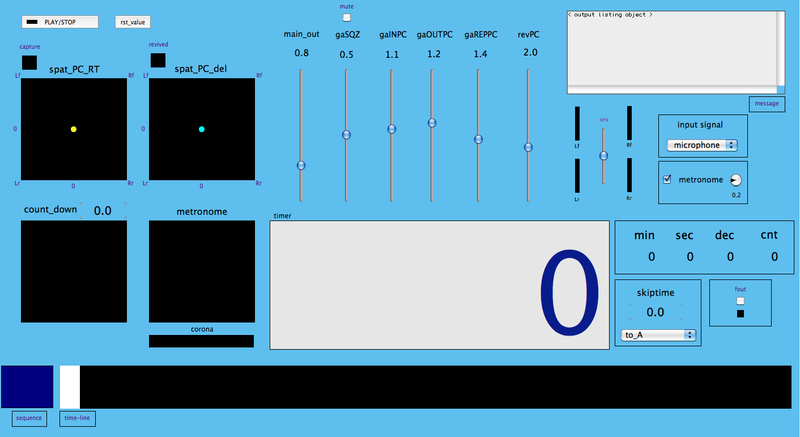 In addition to the interactive GUI controls (shown below), the timer and the time-line tools contribute to the dynamics of the electronics. Figure 2. GUI for Cluster by Enrico Francioni. 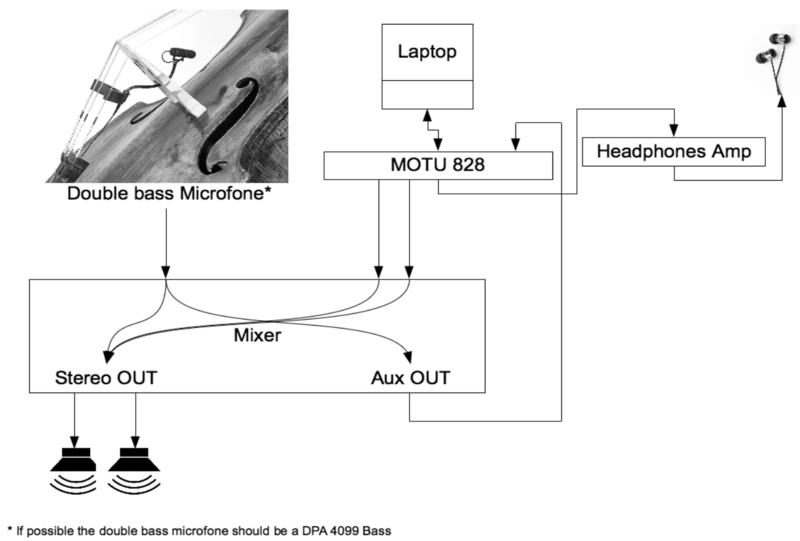 The following diagram illustrates the signal path with its treatment, the tape part and routing of the audio of a metronome. Figure 3. Flow diagram for Cluster by Enrico Francioni. I will now reflect in my article upon the use of real-time spatial movement, as used in my piece eSpace. Some years ago I had the idea of adding effects to some piano pieces by the composer Henry Cowell. The proposal was to give the pieces additional interest. I was studying spatial aspects for an application in terms of location or spatial movement in a quadraphonic space. It seemed like it would be a good exercise to my teacher and myself. My contribution would be limited to the design of the patch and to the movement of the spatialised signals during the performance of Cowell’s pieces. The code for this system requires the use of different instruments, each with a specific role in the routing of the signal; I would like now to describe some of them. One of the instruments is designed for directing the spatialisation in straight segments, sometimes with recursive movements. The variables kx and ky are responsible for shaping the motion of the signal within the quadraphonic space. The following example will show the generation of those two values. Shown below is the code for free movement by GUI joystick. Below is a fragment of code showing random signal location in additional instruments. The selection of the various types of spatialization of the signal is carried out through a button exclusive to the Widget. Finally here is the interface of eSpace. Figure 4. 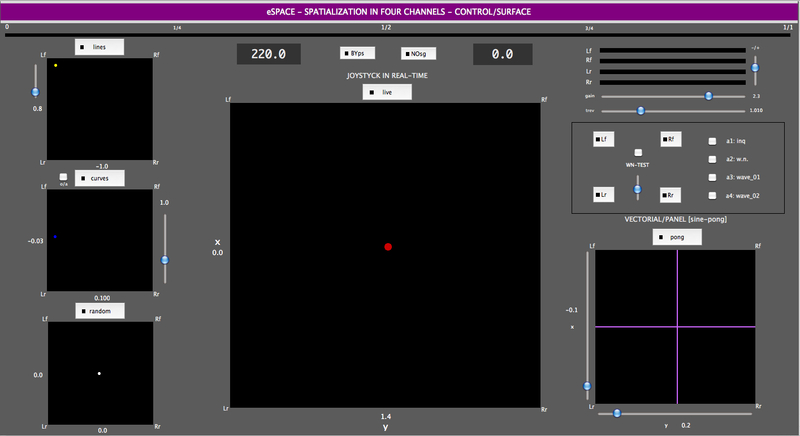 GUI from eSpace by Enrico Francioni. To conclude this section of Part II of this article, I would briefly like to review some experiments carried out by other composers, who have used Csound in real-time for live electronics. In the systems that we have analyzed above, there is often a leveraging of pitch and/or amplitude RMS data to influence the behaviour of the algorithm. This patch uses the pitchamdf opcode which uses the AMDF (average magnitude difference function) method. It outputs both pitch and amplitude tracking signals. The method is quite fast and should run in realtime. This technique generally works best with monophonic signals. Contrastingly, this patch gives us the opportunity to use time, duration, and rhythm, as parameters that can define the triggering of other events. 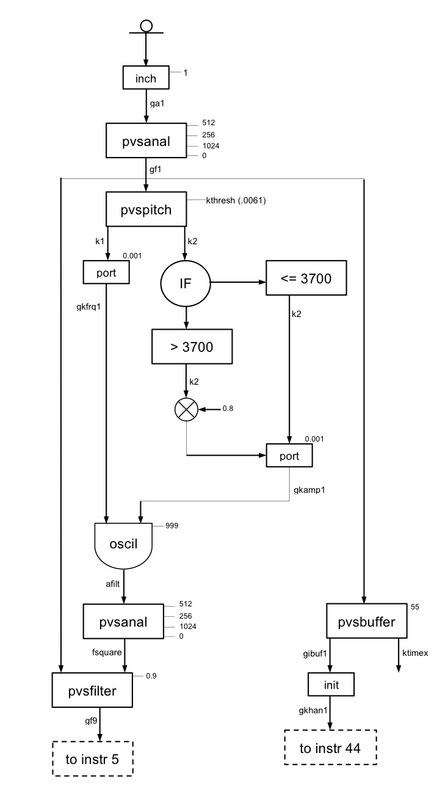 This seems to me a really interesting approach when working with a live signal input. The code excerpt shown below suggests how a live audio signal can be read into Csound, low pass filtered using the tone opcode to suppress high frequency transients and then scanned using the RMS opcode (root-mean-square method) to provide a measure of changing sound intensity. Amongst the other original ideas contained within this patch, are the possibility to adapt the speed of the pulses of the algorithm to those of the performer and to impose a pitch that matches the pitch of the pulses. The initial count-in also seems to me noteworthy: this is implemented by simply beating at least four pulses in front of the microphone to activate the algorithm and and to put into action an event that has been prepared. Let us now have a look at the global variables shown in the example below. Shown below is the behavior of the code if the pulses are less than or equal to three. printks    "Restarting the count in",0    ; Press "Restarting the count in"
Shown below is what is followed if the pulses number more than three. If the pulses number more than three, the "Accompanist" activates the desired event, using the call shown below to help fulfill the goal of the project. Another very original patch that diverges from normal methods for live electronics involving a performer, microphone and computer is Claire 2.0 by Matt Ingalls. For convenience in reporting the comments by Matt, I will extract certain passages of code. me accuracy & cpu )" . This is shown below after the acquisition of the microphone signal and filtering. idbthresh            =      20     ; amplitude, expressed in decibels, necessary to ensure that the pitch is active. He once started continues until it is 6 dB down. ifrqs                =      120    ; number of division of one octave. Default is 12 and is limited to 120.
iconf                =      10     ; the number of structures had need of a jump in eighth. Default is 10.
istrt                =      8      ; start of the pitch for tracker. The default value is (ilo + l'ihi)/2. iocts                =      7      ; number of decimation of eighth in the spectrum. Default is 6. "[it] mostly determines if a new ‘note’ has started and/or the current ‘note’ has ended. Since what we hear as one of those can either be a change in pitch or in amplitude, there is some logic needed to determine that. At the same time, I keep track of the duration of notes and the time between the last note starting and the current note starting, which I call ‘density’." The portion of the code that determines the logic of the note-on and note-offs is very enlightening because it allows for an absolute control of the signal. The initialization of the k variables is shown below. This section of the code shows the approach for amplitude. This section of the code shows the approach for pitch. Matt explains that "when the note ends, I write its info (pitch, dur, amp, density) to a table used in the ‘analysis’ instrument". Matt continues to describe "Analysis: averages & limits of input" . Below is the logic of the code to calculate averages and signal limits based on the single amplitude. The variables that follow are photographed every 16 milliseconds. After the condition of the loop below is satisfied, gk values are then passed to the instrument PlayMode. "+ Play: spawns ‘events’ (for an instrument playing pre-sampled sounds from my own playing) and has different ‘modes’ of playing based on analysis and lots of random numbers. I add more ‘play’ instruments as the piece progresses. "Etude No.3 is one of a set of studies for the trumpet and a computer. The computer program is interactive in that the performance of the trumpeter influences the pitches and rhythms produced by the computer. The language of the computer program is Csound, one of several computer-music languages which have been under develdopment since the 1960s. The sounds which appear in this Etude include altered (processed) versions of the trumpeter’s timbre as well as new synthesized sounds produced by the computer but influenced by the way in which the trumpeter plays his part." The author wants to leave the interpreter free of sliders, knobs, buttons, MIDI systems and so on and to make the algorithm react only to the sound of a musical instrument, in his case the trumpet. Shown below is a synthesis of the entire algorithm for Etude3 by Bruce McKinney. The first part shown is where McKinney reads in the signal and performs an analysis on it with code utilizing the pvspitch opcode. Figure 5. 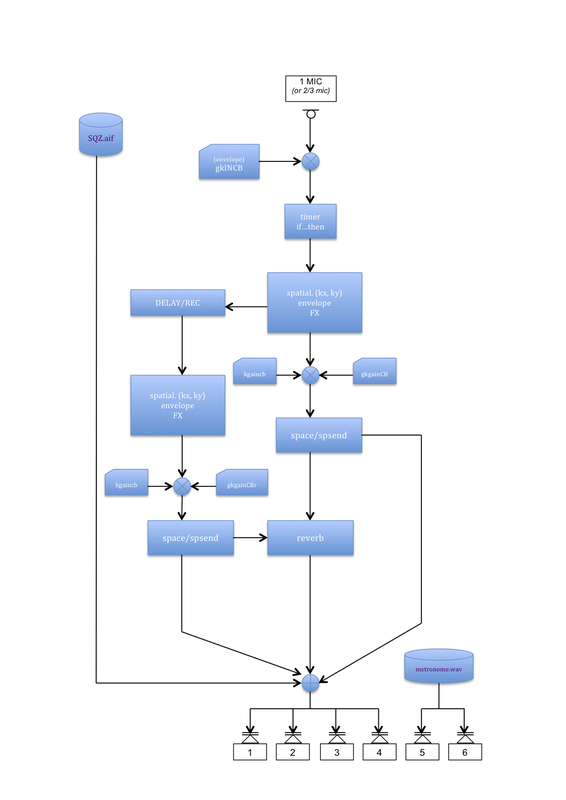 Flow chart from from Etude3. Clarinet-like instrument 1 and 44 input from mic to computer: A/D conversion. Create a phase vocoder (PV) analysis. pv pitch/volume track the sound at control rate. Put pv analysis into a buffer for use as "trumpet-like" delayed sound. Buffer turns over every 55 seconds. Compare input pv analysis with pv analysis of a square wave (clarinet-like). PV filter the input analysis so that only clarinet-like components are let through. This is the basis of the Clarinet-like instrument. controls the turning off of instrument 44 and controls instrument 23. Sample the trumpet pitch from the pitch tracker. Randomly choose one of 5 sets of pre-determined notes (defined as transpositions of the trumpet pitch) from a table. There are 1-5 notes in a set. Each note of the set is randomly displaced by -2 ...+2 octaves. Send the appropriate intervals to the "wave-shaper" instrument so that the notes play .2-.5 seconds apart. low-pass filter at 1000 cps NB: Wave-shapers have been around for a long time. This is a very efficient way to synthesize an interesting sounding timbre that is "wind-instrument" like. Trumpet-like delayed sound, instrument 5 - ONLY AFTER 30 seconds AND ONLY until a key is pressed on the keyboard (near the end of the piece). read a random amount of the buffer containing the input sound (1-5 seconds). randomly transpose the pv stream. randomly speed up/show down the reading (faster/slower note play). randomly change the timbre of the sound by including more/fewer pv bins and/or starting with a higher bin and/or including only every 3rd (4th or 5th) bin. Finally, there is A/D conversion, reverb, and output. The last piece I want to describe, Im Rauschen, cantabile, is for double bass and electronics (2012) and was written by Luís Antunes Pena. The piece does not use the microphone for live electronics, but is controlled directly from the keyboard of the PC via the operator using sensekey or sense and MIDI commands through a musical keyboard interfaced to the system. In the interest of an execution one-man performance, I think that this strategy is a medium that adds to the possibility to the interpreter to handle more events in real-time. Obviously the interpreter might become distracted from the performance by devoting himself to giving commands at the keyboard, and that could also lead to the involvement of an assistant for the live electronics. Below is a part of the patch dedicated to the input keys with the opcode sensekey. ; changed — k-rate signal change detector. This opcode outputs a trigger signal that informs when any one of its k-rate arguments has changed. Useful with valuator widgets or MIDI controllers. Partial code from instrument 4 shows it will activate events according to the scheme shown below. prints "\n\n\n -----------> Selected Sample: "
Figure 6. Schematic layout for Im Rauschen, cantabile. In some pieces there is a need for a metronome click through headphones (stereo) or through a headset (mono) for the benefit of the performer so we frequently find a greater number of channels that expected (e.g. 3, 5, 6, etc...) are necessary in the .csd. For example in the case of the previously discussed piece Cluster, the first four channels are dedicated to the sound of the piece with two further channels (5 and 6) being used for the metronome. The main piece of Im Rauschen, cantabile is stereo so the first two channels are reserved for that with a third track being necessary for the click of the metronome. To conclude this survey of patches dedicated to real-time processing in performance, a brief mention is made of another example Will you fizz electric down the black wire to infinity (2009) by Rory Walsh which utilizes a midi controller UC-33. "This composition for piano and computer forms part of a larger work which is still under development. The piece focuses on heavily processed piano sounds which are captured in realtime by the computer. The computer then runs a sequence of different algorithms that manipulate and alter the sounds being output through the speakers. Rather than viewing this piece as a straightforward duet for piano and computer I see it more as a solo piece for computer, with the piano driving the computer’s performance. Special thanks to Orla who let me borrow a line of text from one of her emails and use it as a title for my piece." Upon completeing this extensive survey of the use of live electronics in chamber music using Csound it is clear that the work of programming is challenging; by applying the language to the few ‘historical’ pieces as well as to other recent compositions. Csound when ised in real-time can present some significant challenges, particularly those relating to user-control can be particularly difficult. However, after a careful study of what the potential of code and opcodes available is, it quickly becomes apparent that Csound excels at performing very precise and exacting processing upon a signal. This is not just as an auxiliary element to be modified and modeled, but is a valid resource to exploit in order to dictate within the csd what ‘could be’ the actual path of the algorithm and therefore the fate of the song, that is what the composer, and for him the interpreter, wants to realize in real-time. I would like to thank John Fitch, Eugenio Giordani, Joachim Heintz, Matt Ingalls, Iain McCurdy, Bruce McKinney, Alessandro Petrolati, Luis Antunes Pena, Vittoria Verdini, Rory Walsh for helping me in various ways on the realization of these articles. 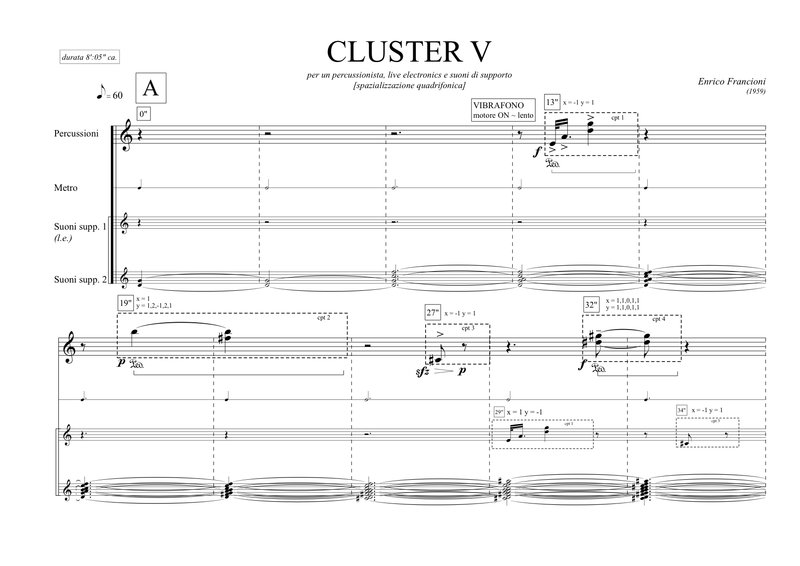 E. Francioni: "Francioni-CLUSTER V (demo-2ch)," (for a percussionist, live electronics and sound support). Internet: https://soundcloud.com/enrico_francioni/cluster-v-demo-2ch, [Accessed October 17, 2016]. Luís Antunes Pena, 2012. "Im Rauschen, cantabile." Available: http://luisantunespena.eu/imrauschencantabile.html. [Accessed Nov. 1, 2016]. Andrew Brothwell, John Ffitch, 2008. "An Automatic Blues Band", Proceedings of the 6th International Linux Audio Conference, Kunsthochscule für Medien Köln, pp. 12–17. Available: http://opus.bath.ac.uk/11394/2/13.pdf. Enrico Francioni, 2007. "eSpace", csd for real-time spatial movement, Pesaro, Italy. Bruce McKinney, 2007. "Etude3", for trumpet and computer, Cranford, NJ, USA. Rory Walsh, 2009. "Will you fizz electric down the black wire to infinity", for piano and computer. J. Heintz, J. Aikin, and I. McCurdy, et. al. FLOSS Manuals, Csound. Amsterdam, Netherlands: Floss Manuals Foundation, [online document]. Available: http://www.flossmanuals.net/csound/ [Accessed May 25, 2013]. Riccardo Bianchini and Alessandro Cipriani, "Il Suono Virtuale," (Italian Edition). Roma, IT: ConTempo s.a.s., 1998. Richard Boulanger, The Csound Book, The MIT Press-Cambridge, 2000. Enrico Francioni, Omaggio a Stockhausen, technical set-up digitale per una performance di "Solo für Melodieninstrument mit Rückkopplung, Nr. 19", in AIMI (Associazione Informatica Musicale Italiana), "ATTI dei Colloqui di Informatica Musicale", XVII CIM Proceedings, Venezia, October 15-17, 2008 (it). Karlheinz Stockhausen, Solo, für Melodieinstrument mit Rückkopplung. Nr. 19, , UE 14789, Universal Edition-Wien, 1969. AIMI (Italian Association of Computer Music). Internet: http://www.aimi-musica.org/, 2015 [Accessed October 16, 2016]. A. Cabrera, et. al. "QuteCsound." Internet: http://qutecsound.sourceforge.net/index.html, [Accessed May 16, 2016]. apeSoft. Internet: www.apesoft.it, 2016 [Accessed October 16, 2016]. Boulanger Labs. cSounds.com. CSOUNDS.COM: The Csound Community, 2016 [Accessed May 16, 2016]. I. McCurdy and J. Hearon, eds. "Csound Journal". Internet: csoundjournal.com [Accessed May 16, 2016]. E. Francioni. "Csound for Cage’s Ryoanji A possible solution for the Sound System," in Csound Journal, Issue 18. Internet: http://www.csoundjournal.com/issue18/francioni.html , August 3, 2013 [Accessed October 17, 2016]. E. Francioni. "Cage-Ryoanji_(stereo_version)_[selection]," (on SoundCloud). Internet: https://soundcloud.com/enrico_francioni/cage-ryoanji-stereo_version, [Accessed October 17, 2016]. E. Francioni. "Stockhausen-SOLO_[Nr.19]_für_Melodieninstrument_mit_Rückkopplung," (Version I). Internet: https://soundcloud.com/enrico_francioni/kstockhausen-solo_nr19_fur_melodieninstrument_mit_ruckkopplung, [Accessed October 17, 2016]. E Francioni. "SOLO_MV_10.1 Solo Multiversion for Stockhausen’s Solo [N.19]," in Csound Journal, Issue 13. Internet: http://www.csoundjournal.com/issue13/solo_mv_10_1.html , May 23, 2010 [Accessed October 17, 2016]. iTunes. "SOLO [Nr.19]," by apeSoft. Internet: https://itunes.apple.com/us/app/solo-nr.19/id884781236?mt=8, [Accessed October 17, 2016]. J. Heintz. 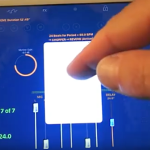 "Live Csound, Using Csound as a Real-time Application in Pd and CsoundQt." in Csound Journal, Issue 17. Internet: http://www.csounds.com/journal/issue17/heintz.html , Nov. 10, 2012 [Accessed October 17, 2016]. 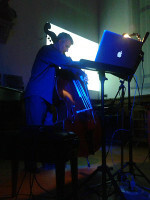 Enrico Francioni graduated in Electronic Music and double-bass at the Rossini-Pesaro. His works are carried out to Oeuvre-Ouverte, Cinque Giornate per la Nuova Musica, FrammentAzioni, CIM, EMUfest, VoxNovus, ICMC, Bass2010, Acusmatiq, etc. He performed the world premiere of the Suite I F.Grillo. From author and soloist was awarded in national and international competitions. He has recorded for Dynamic, Agora, Orfeo and others. He is dedicated to teaching and has taught double-bass at the Rossini-Pesaro.